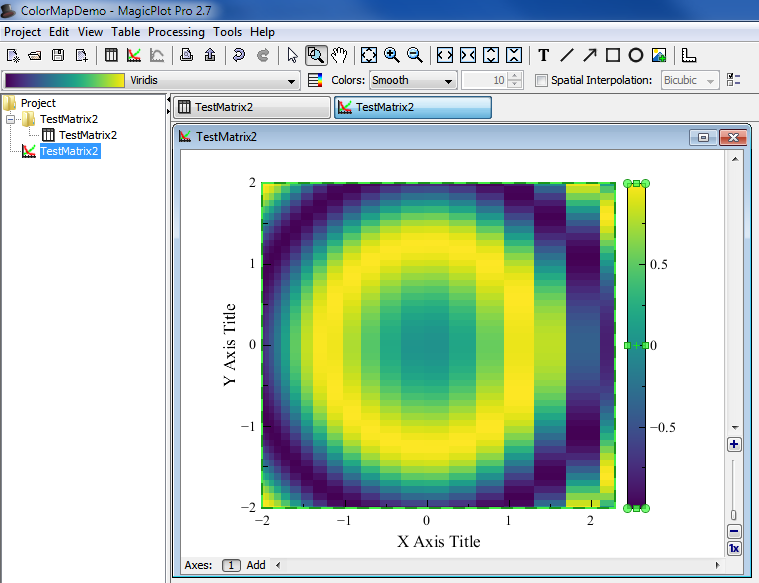 This PDF document was compiled from MagicPlot online help. Use Project → Import Text Table menu item to import table(s) from text file(s), also referred to as ASCII file(s). You may select multiple files in opened standard file dialog by holding Ctrl or Shift. If you select incorrect file(s) by mistake, click on Open icon to open file dialog once again and select other file(s). 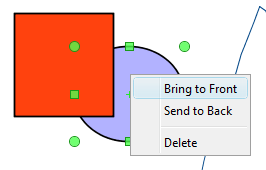 You can enlarge a part of the preview plot by selecting an area by mouse (scale box zoom tool). 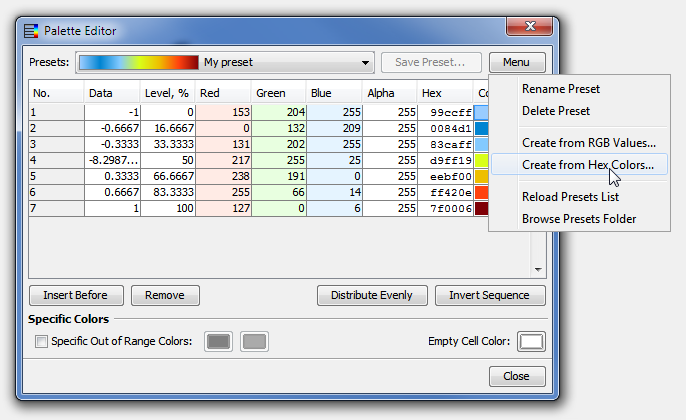 Use context menu of the plot to change scale zoom to default. F5 key reloads the text file or reloads the data from clipboard. MagicPlot opens files which come as the command line arguments on launch. 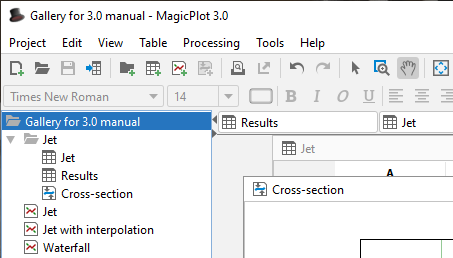 MagicPlot Project files (.mppz) are detected as projects, the all other files are treated as the text files and the Import dialog is opened. The text files will be imported in the current opened project. The -silent key in command line forces MagicPlot to import text files without opening import dialog. The previously used import setting are used in such case. 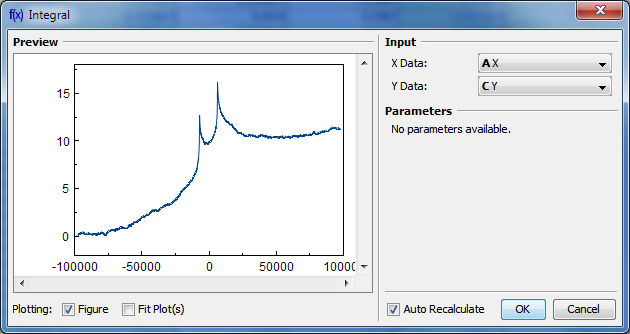 If Fit Plot or Figure creation was selected in Import dialog last time, the new plots will be created. Please make sure that your firewall software does not block MagicPlot loopback (127.0.0.1) request. You can create a full copy of selected project components (Tables, Fit Plots, Folders, Figures) by selecting Create a Copy item on context menu. 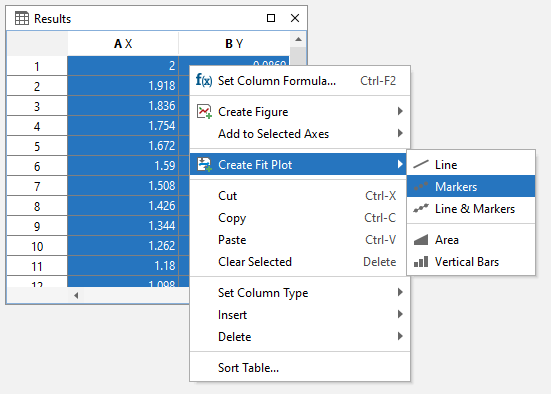 If the only Fit Plots and Figures are selected for creating a copy, the created Fit Plots and Figures will use data from the same tables and columns as initial ones. 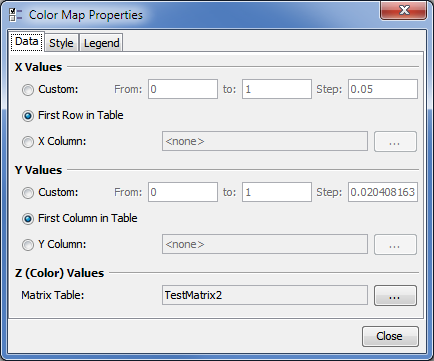 If you select also the Tables which contain plotted data, then the created Fit Plots and Figures will use data from created copies of these Tables. 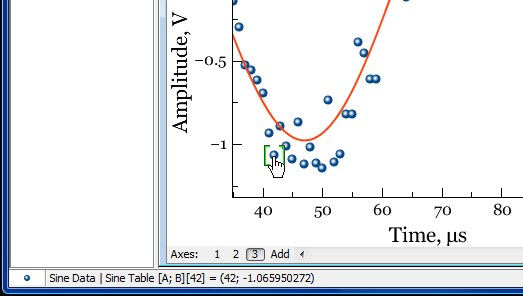 You can use cubic spline to subtract baseline on Fit Plot. 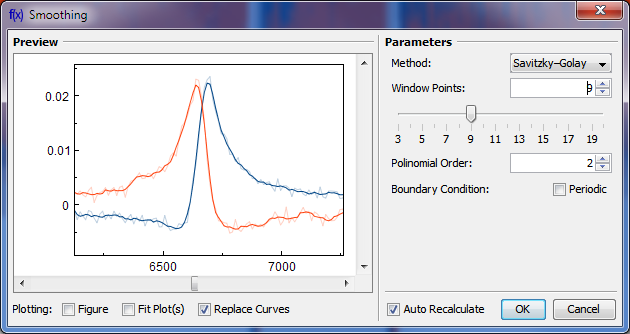 To create spline curve click on Add button in Fit Curves tab of Fit Plot and select Spline menu item. 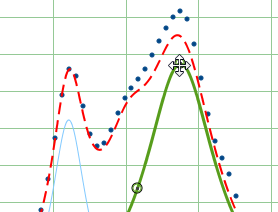 Do not use splines to subtract baselines which can be fit well enough with Line curve (line or constant baseline). You may mistakenly subtract wide peaks using spline. In some cases Parabola curve may be more suitable. 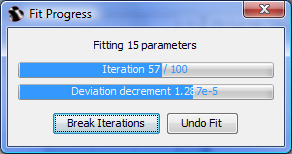 Set Baseline checkbox in spline row in fit curves table to subtract spline from data. Spline anchor point (x, y) coordinates are treated as fit parameters so you can perform fitting with spline although we don't recommend this technique. Fitting the baseline with some adequate model function is preferred. 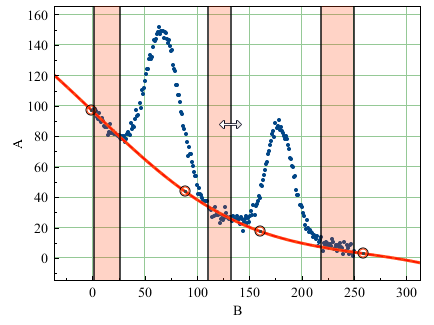 It is recommended to set appropriate fit intervals which contain only baseline without peaks. 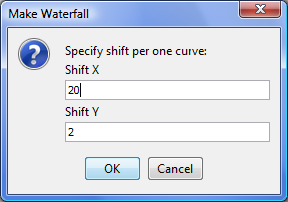 In such case Fit One Curve button is more acceptable than Fit by Sum button, because the individual interval for current curve will be used and the interval from Fit Interval tab (which is used to fit by sum of curves) is ignored. 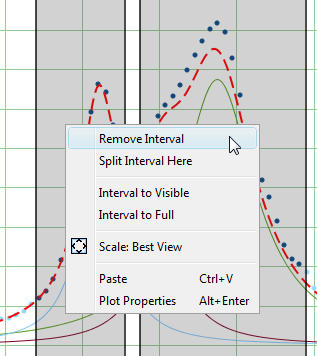 Select spline curve and set Edit Interval checkbox in the bottom of the panel to edit spline interval, then click on Fit One Curve button. The anchor point coordinates will be varied but the number of points will remain. You also can lock some parameters (usually x coordinates) by setting Lock checkboxes in parameters table. 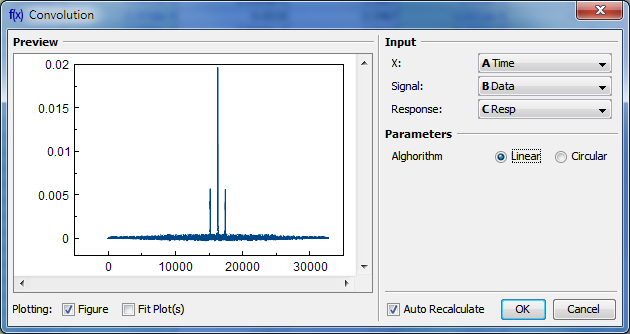 MagicPlot can approximately locate peaks in spectrum. 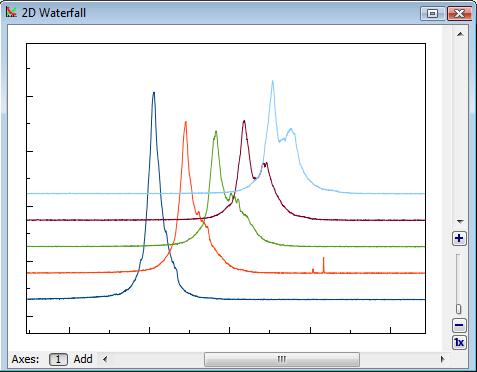 To locate peaks click on Guess button in Fit Curves tab of Fit Plot. Peaks are added at position of global extremum of data-baseline with previous peaks subtracted. 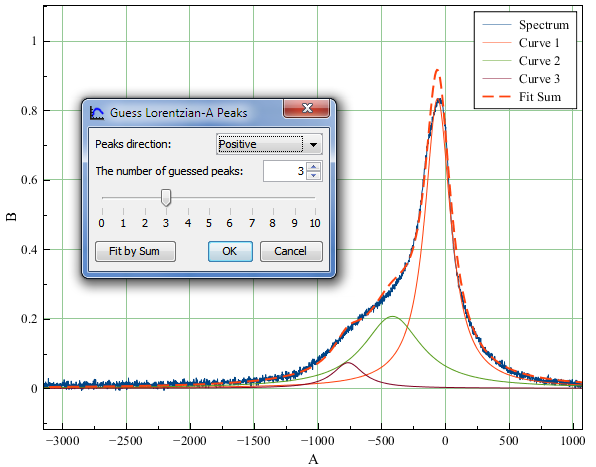 When Guess Peaks window is open you can see the preview of guessed peaks on Fit Plot. This preview is updated every time you change the parameters in the window. 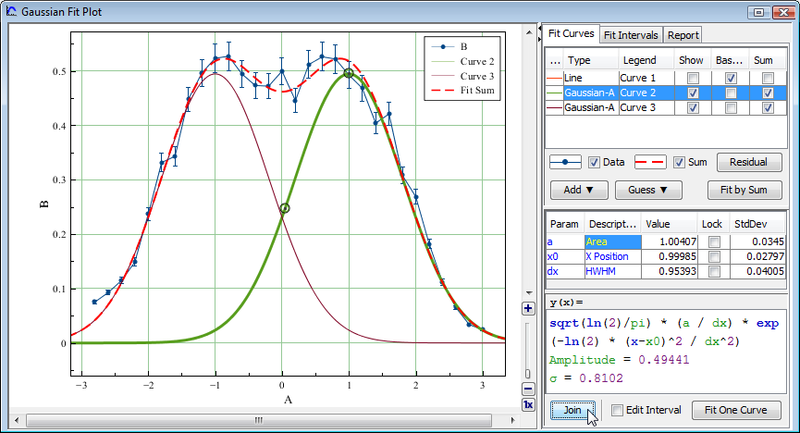 Fit Curves and Fit Sum are treated as function equations in MagicPlot Fit Plots. But in some cases (e. g. to export and plot fit data with other application) you may want to create (x, y) table with Fit Curves y-values. 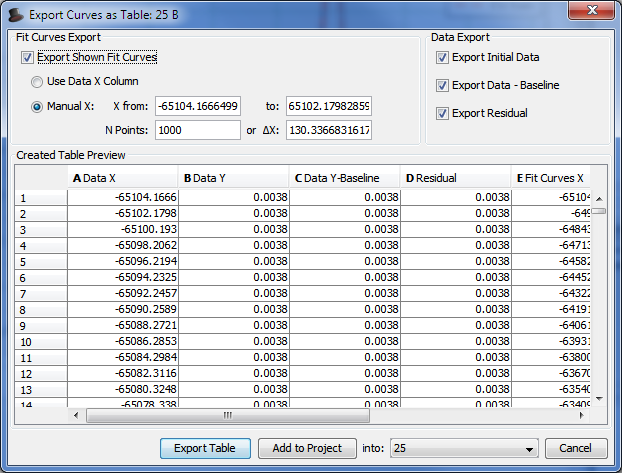 For this purpose use Tools → Export Curves as Table menu item when Fit Plot is active. 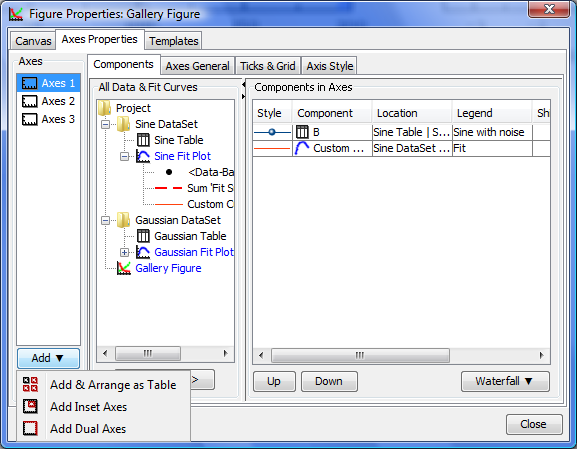 This dialog is also available for Figures. 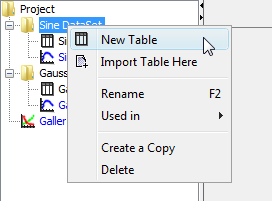 You can either add new Table to a Folder in current Project or export table to a text file. 1. Select column and write formula in formula string. 2. 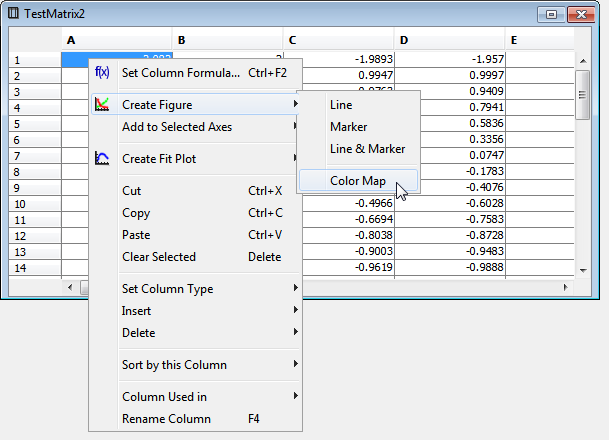 Use Table → Set Column Formula menu item to open column formula dialog window. See formula syntax for details. Variable i contains the current row index. Rows are enumerated from 1. Rows are always evaluated one after another from the first to the last in the specified range. Accordingly the row number i is incremented after each step. You can use this behavior to calculate factorial: set 1 in the first row of column A and after that set formula cell(A, i-1) * i and rows interval from 2 to 100. Note that formula is to be set for rows beginning from the second, and not from the first. You will get the factorial of row number (i). col(A) – returns the value of cell in column A in the current (i-th) row. Equivalent to cell(A, i). cell(A, 3) – returns the value in column A and row 3. You can use either upper-case letters (A…Z, e.g. col(B)) or numbers (1, 2, 3,.., e.g. col(1)) in columns numeration in arguments of col and cell functions. 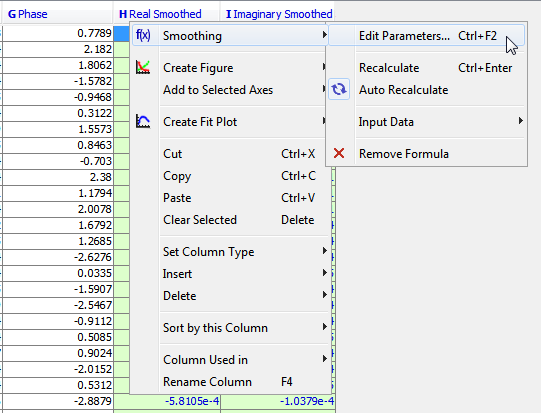 Set formula col(A)*2 for column B and set Auto Recalculate checkbox. Column B will be recalculated if you change values in column A or column A is updated by other formula or processing algorithm (e.g. integral, derivative of other column). 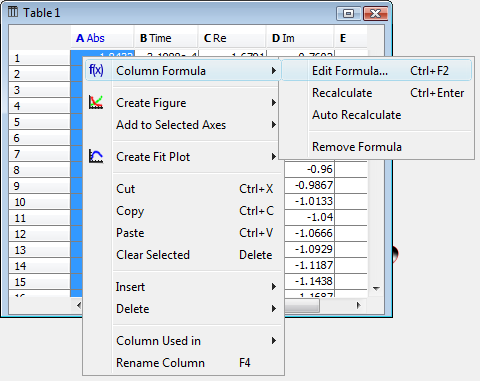 You can edit column formula and change auto recalculation mode from column context menu or menu Table. Select exactly one column and open context menu to view this menu items. Some mathematical functions can be defined only on a certain interval. 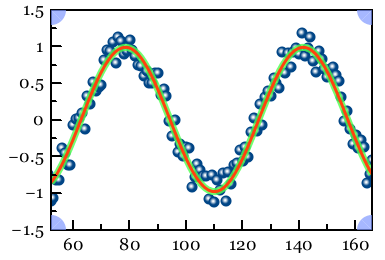 For example, square root (sqrt(x)) is not defined for negative numbers (all calculations in MagicPlot are made in real numbers, not complex). Hence if the argument of sqrt is negative, a Not-a-Number (NaN) is returned. If a NaN value occurs in some part of formula, the result of calculation will also be a NaN, and corresponding table cells will be empty. The calculations are not terminated if NaN value occurs in some row(s). In some cases you may want to check if a NaN values occurs in calculations. 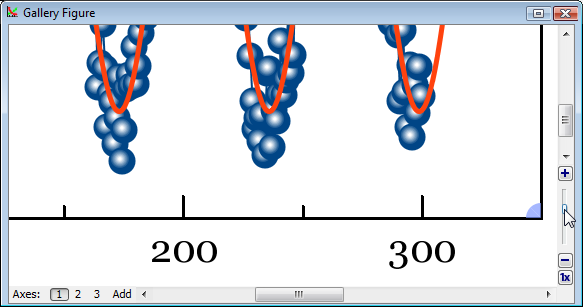 MagicPlot shows the warning “Argument is out of range at row #”. This row number is the first row in which NaN value was returned. 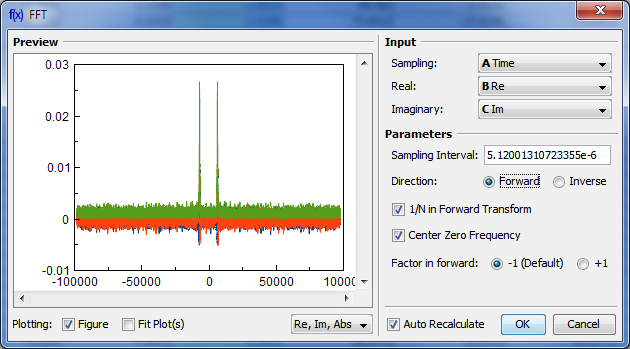 MagicPlot also highlights the function or operator which first produces NaN value. 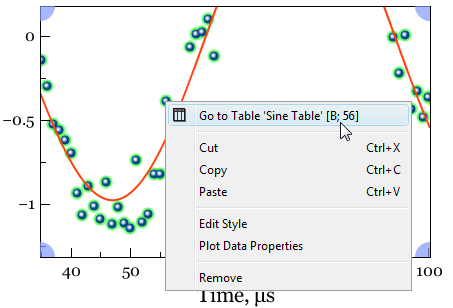 Open Table or Figure or Fit Plot with initial data and select Processing → Smooth menu item. 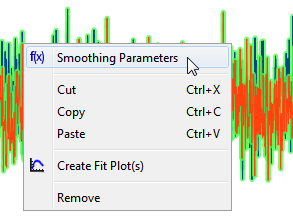 The opened processing dialog shows parameters, initial curves (semi-transparent) and smoothed preview. Periodic checkbox applies on calculation of first and last p/2 points. 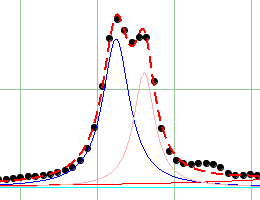 When it is set MagicPlot will take missing values from the opposite end (as if the signal is periodic) to calculate first and last p/2 points. Two algorithms are available: Central Moving Average and Savitzky-Golay method. If Periodic checkbox is not set the first and last p/2 points are calculated with the same symmetrical formula but with less summands. A Savitzky–Golay filter essentially performs a local polynomial regression on a series of equally spaced data points. 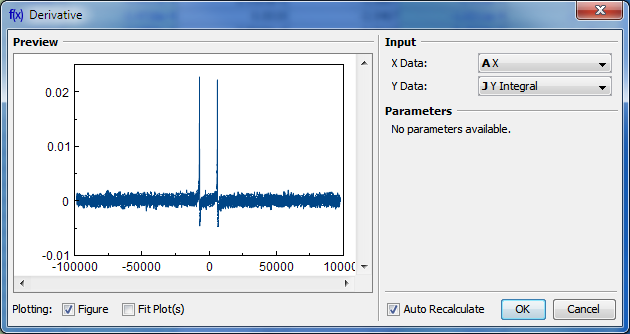 Each data point value is replaced with local polynomial value at this point. 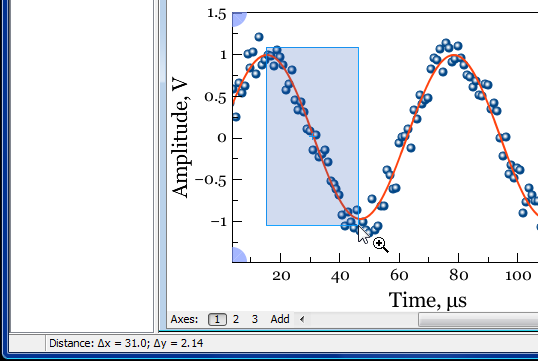 If Periodic checkbox is not set, MagicPlot will repeat the values of the first and last points to calculate a polynomial for the first and last p/2 points. 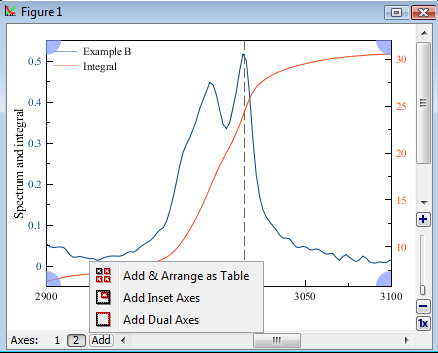 Open Table or Figure or Fit Plot with initial data and select Processing → Histogram menu item to calculate histogram. 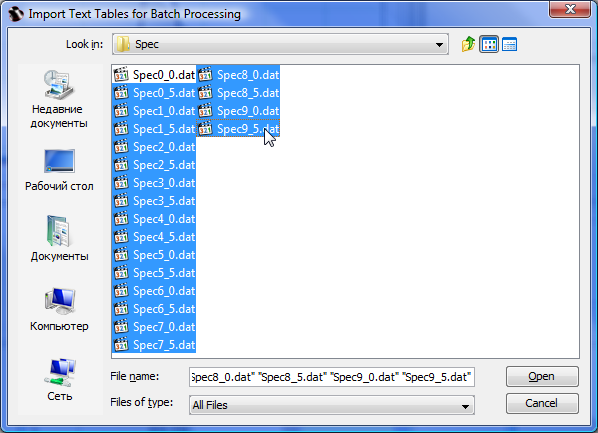 You can either set the bin size/count manually or specify auto binning criteria. 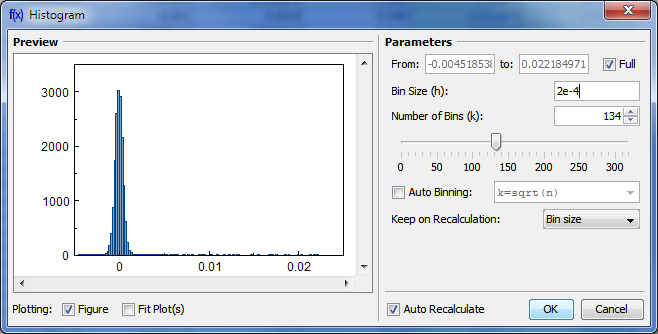 MagicPlot align the the lower limit of the first bin exactly at the beginning of specified histogram range (From field). 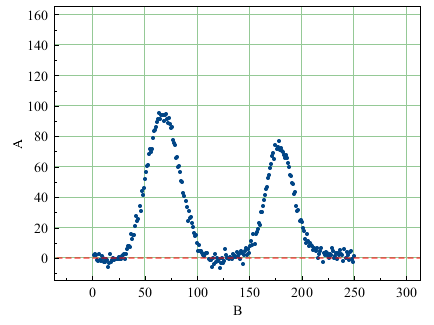 The upper limit of the last bin is calculated on the basis of the specified bin size and may be greater than the specified right histogram limit (to field) as shown on the screenshot above. Enter round value in the From field if you want the lower limit of the first bin to be round. Typing h=... means setting the bin size h.
MISE optimisation — Shimazaki method. 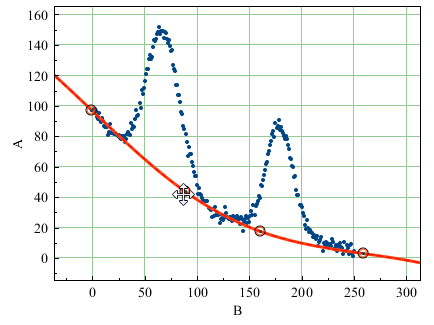 MagicPlot finds the minimum of Mean Integrated Squared Error (MISE) for the number of bins from 2 to min(n/2, 20n1/2) where n is the number of data points. See this paper and site for details: Shimazaki and Shinomoto, Neural Comput 19 1503-1527, 2007, http://2000.jukuin.keio.ac.jp/shimazaki/res/histogram.html. 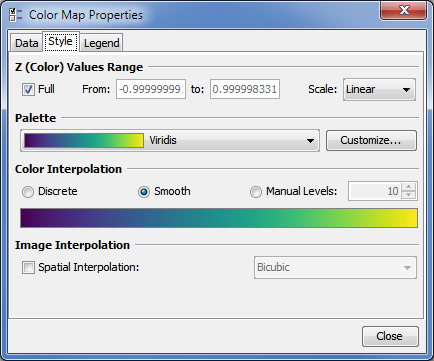 This option is used when the histogram is recalculated. Recalculation may be cause by input data change (if Auto Recalculate checkbox is selected) or invoked manually (Recalculate menu item in histogram table column context menu). 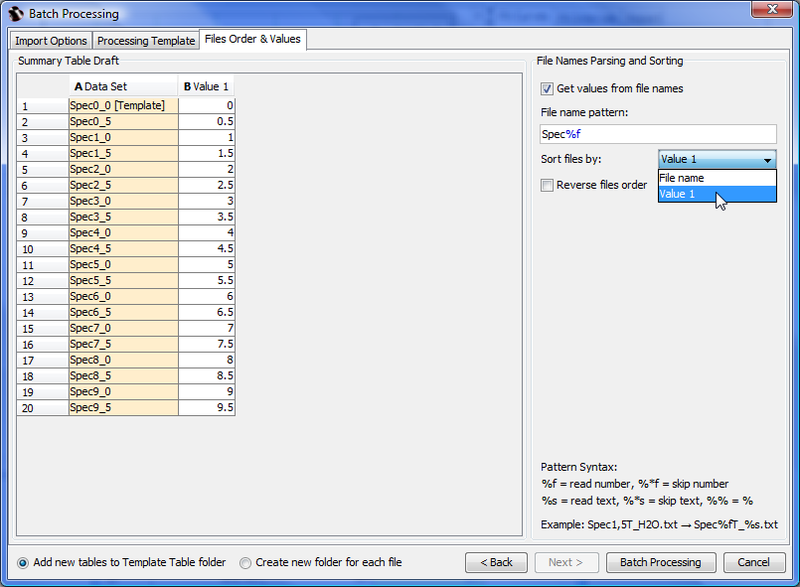 Select Tools → Statistics menu item to open the statistics dialog. 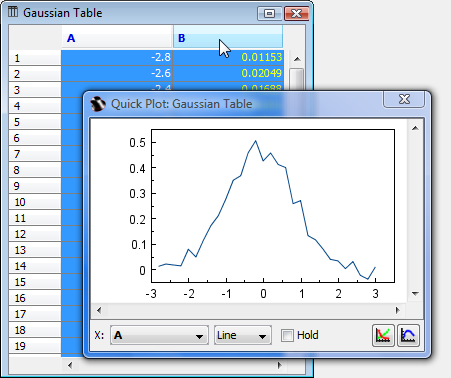 Statistics dialog shows statistics on currently selected table columns or curves on plot. The statistics is updated every time you activate different windows or change the selection in active window. Select multiple instances in one window (columns or curves) to view multiple statistics data. By default some statistical properties are not shown. Click Show button to select which properties you want to calculate. 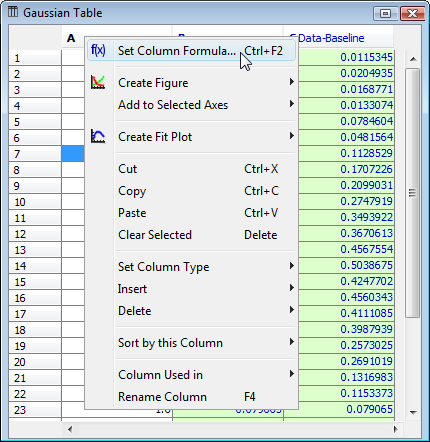 You can also calculate statistics on table columns using column statistics functions when entering column formula. 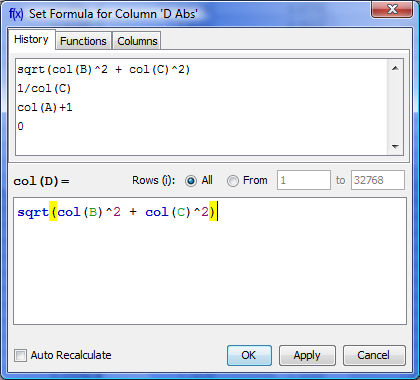 See Functions tab in Set Column Formula dialog for column statistics functions description. 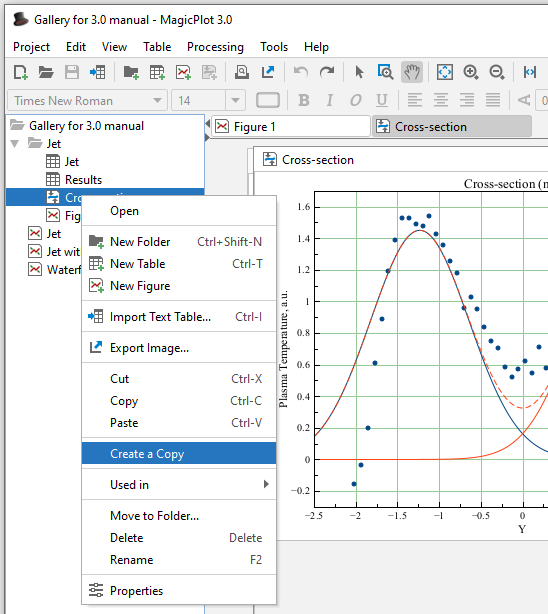 These functions are also available in MagicPlot Student edition. Central moments are calculated as follows (see table). All sums are calculated using compensated summation. 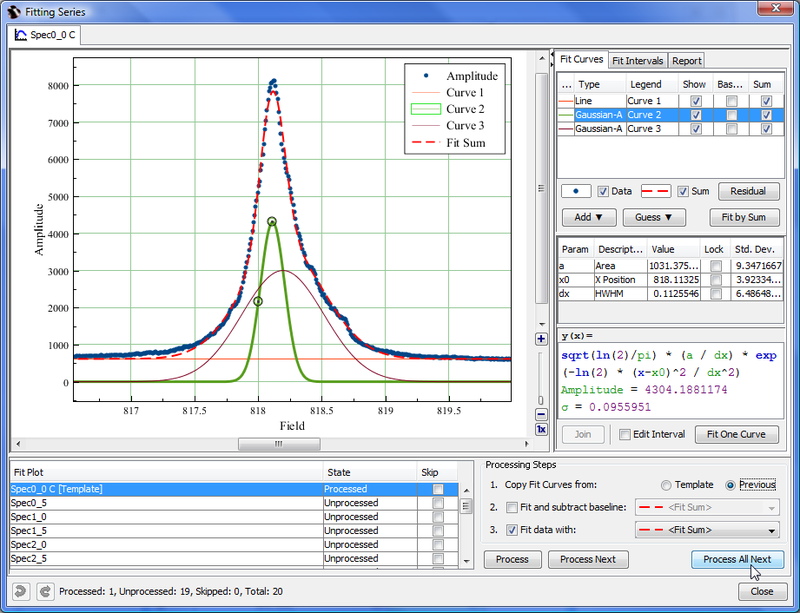 Central moments are calculated on second pass after Mean calculation. 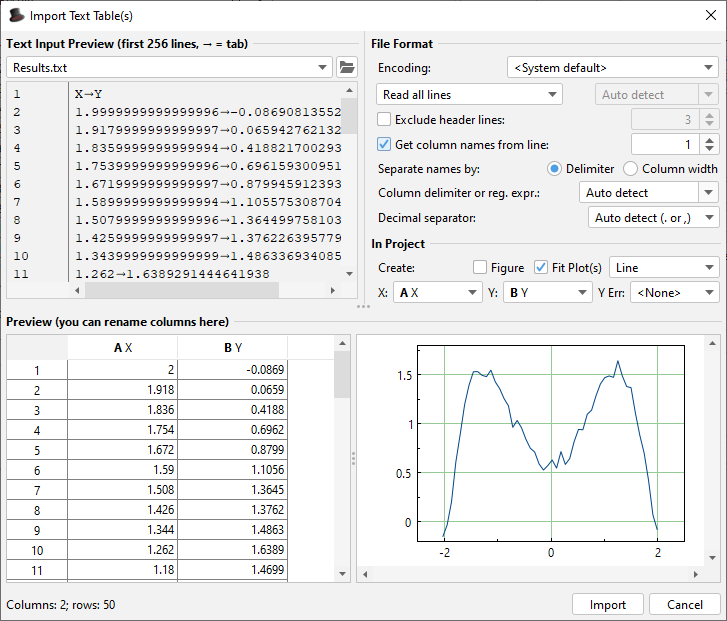 Setting of intervals in Fit interval tab of Fit Plot was initially intended for specifying the range of data which are used for fitting by sum of fit curves. 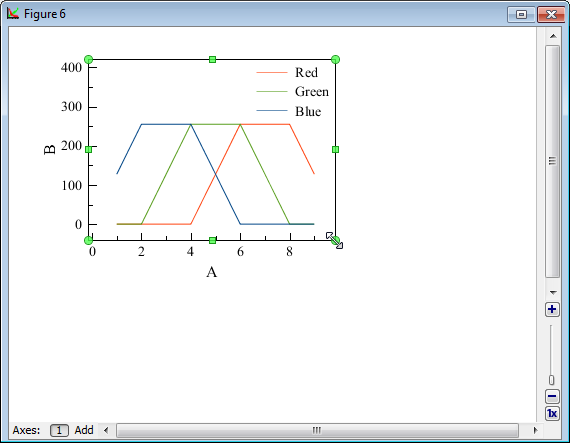 However, this tab can also be used to calculate integrals and statistics on these intervals (Statistics is only available in Pro edition). 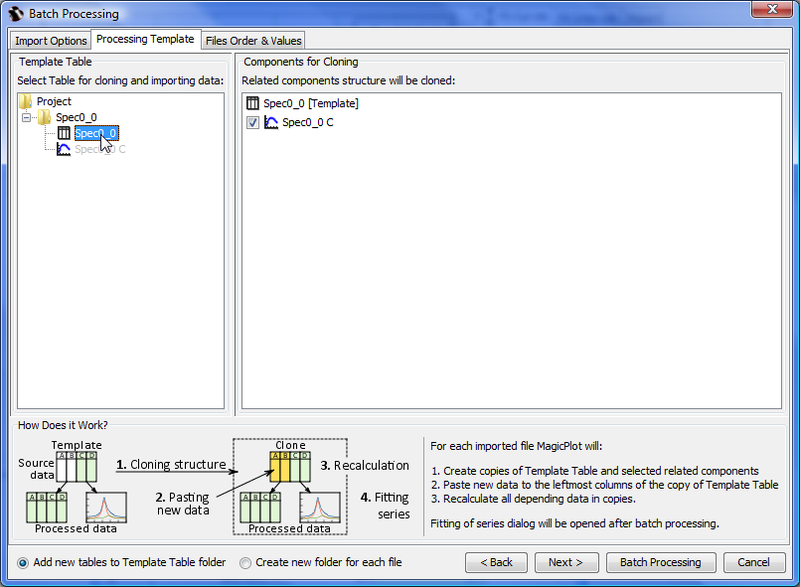 Data-Baseline is used to calculate the results. 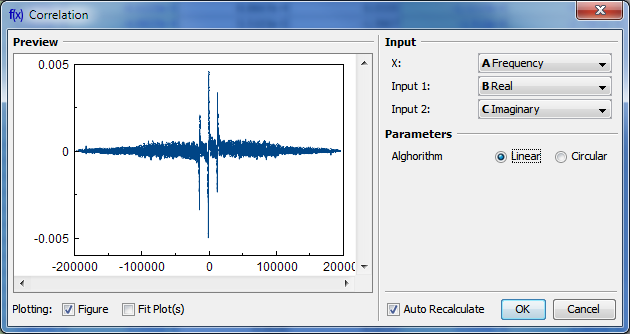 MagicPlot can integrate data on selected intervals and calculate peak moments (x mean, variance, skewness, kurtosis). Spectrum line is treated as probability distribution curve: x values are treated as 'independent variable' and y values are treated as 'probability'. Standard statistical formulas are used to calculate moments (see below). 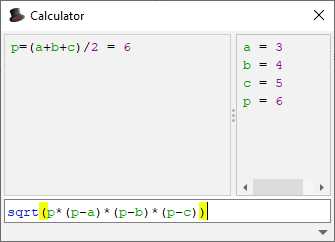 Statistical data and integrals are automatically updated if x or y data are changed or intervals are changed. Move interval borders with mouse. 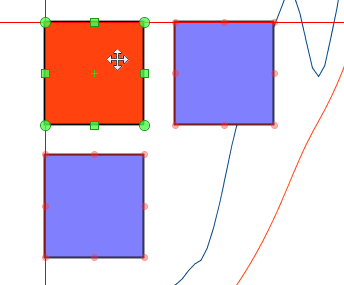 Double click on interval to split it at desired position. Right click opens context menu from which new intervals can be created on free space and existing intervals can be deleted or split. 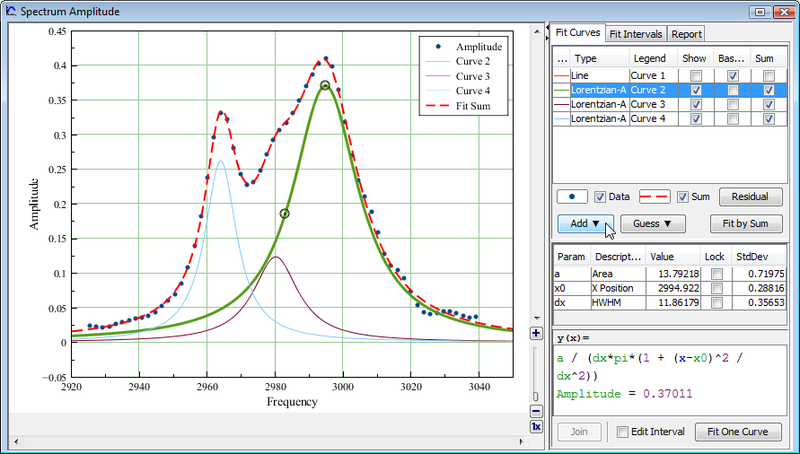 MagicPlot can calculate relative integrals to compare the relative intensity of spectrum lines. To compute relative integrals set Relative integrals checkbox. 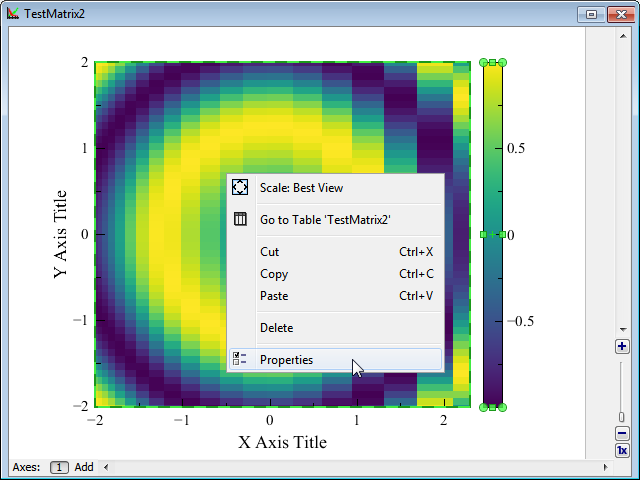 MagicPlot designate the smallest integral as 1, but you can enter a custom value. If you want to set not the smallest integral as a reference point, enter 1 first and then enter the value of desired integral relative to 1 into this field, so that other integrals will be calculated relative to this new value. The best way to create a Figure with desired data is to select x and y data columns in Table and use Create Figure in Table context menu. 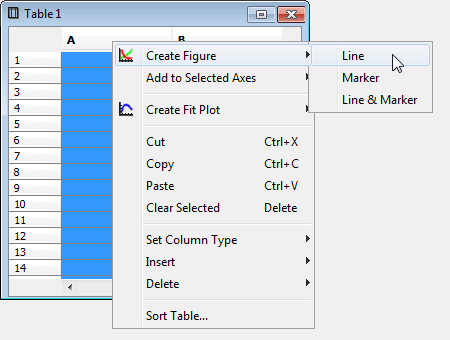 Select x and y columns in table with data, open table context menu (right click) and select Add to Selected Axes sub-menu. All currently opened Figures are listed in this sub-menu. 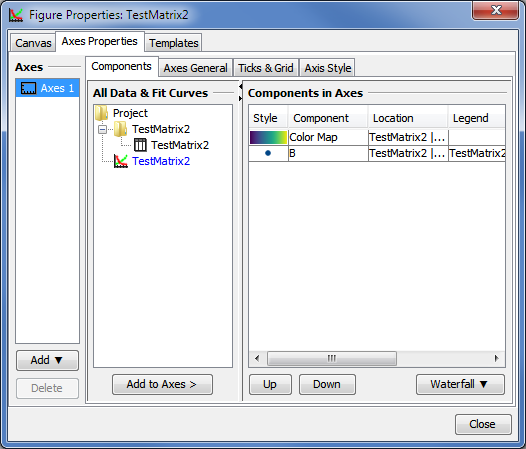 Open Figure Properties window and go to Axes Properties → Components tab. 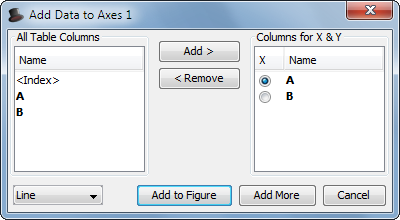 Here you can select the Table in the project tree and press Add to Axes button. Copy and paste Curve from Fit Plot or another Figure to your Figure. 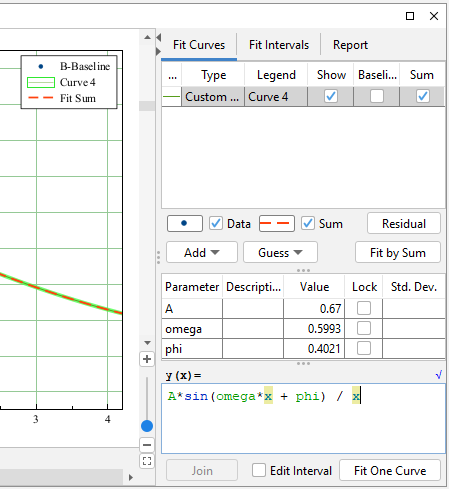 You also can add Fit Curves or Fit Sum from Fit Plot to Figure. 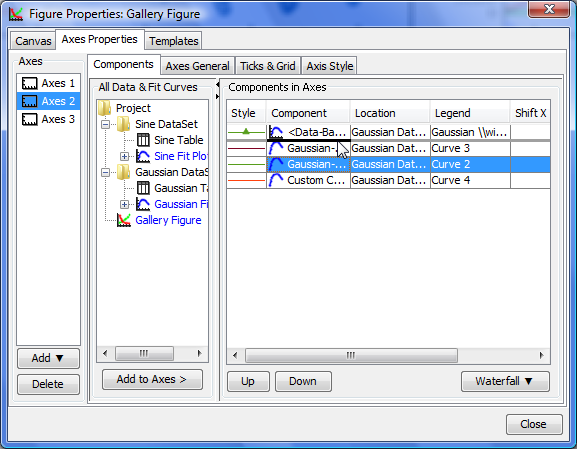 To change Curves drawing order and legend entries order open Figure Properties dialog and go to Axes Properties → Components tab. 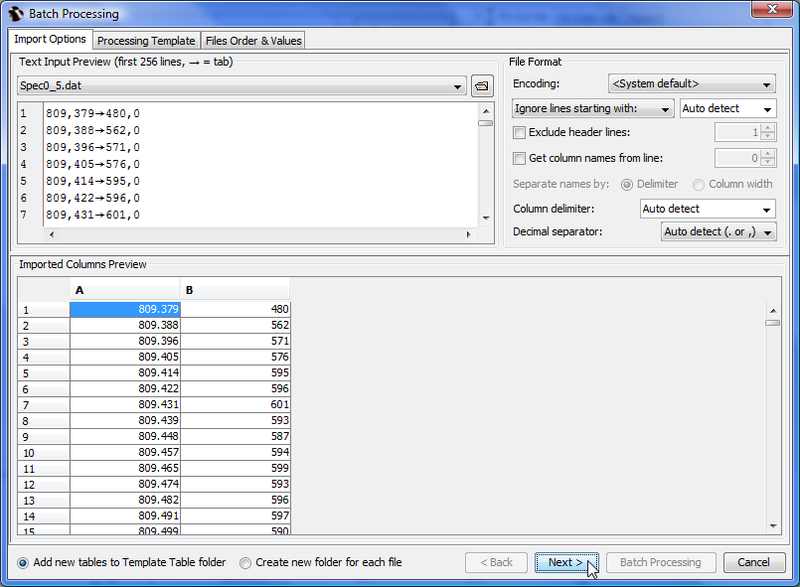 Drag rows in table to reorder. You can also use Up and Down buttons or press Alt + up/down keys (Option + up/down keys on Mac) to move selected row in table up or down. 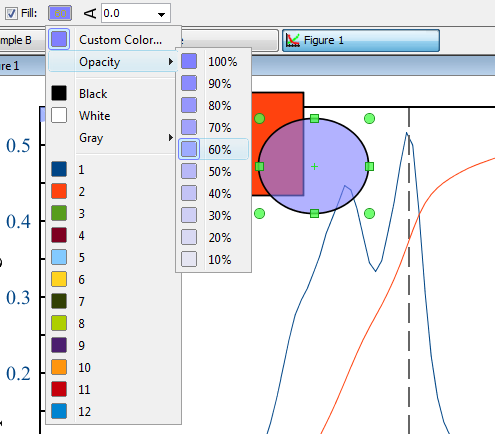 Axes style can be set in Figure Properties window (or Fit Plot Properties for Fit Plot). 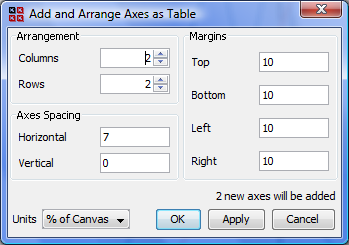 This window contains multiple tabs with axes drawing settings. 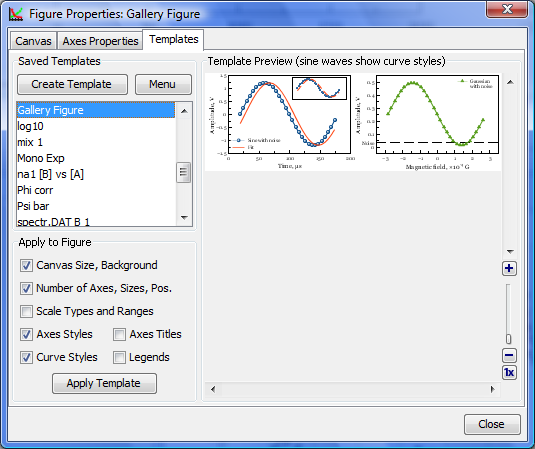 This toolbar is intended for precise setting of the position and size of one or more selected drawn objects on Figure or Fit Plot. You can open Drawing Dimensions toolbar by selecting Tools → Drawing Dimensions in main menu. 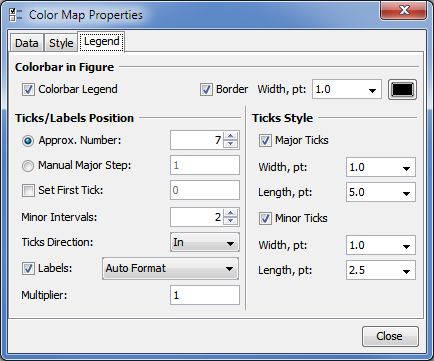 Dimensions toolbar may be left opened. 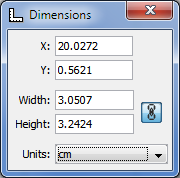 Drawing Dimensions toolbar shows the coordinates and size of currently selected object(s). 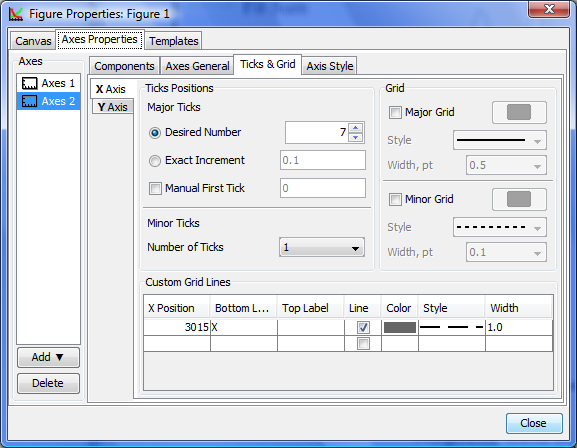 You can also specify the coordinates or size of several components. The x value is measured from the left edge of the canvas. 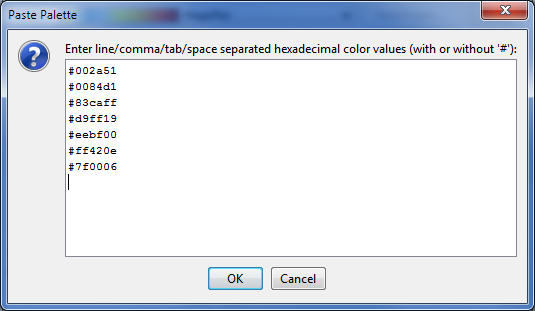 The y value is measured from the top edge of the canvas. For rectangle or ellipse the specified coordinates determine the position of the upper-left corner. 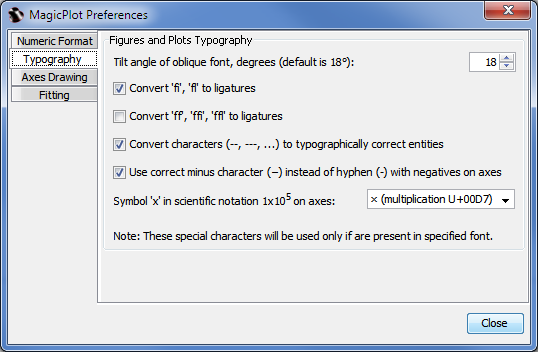 x determines the left edge, center or right edge of text according to text alignment of label. y determines the baseline position of the first line. For line or arrow the specified coordinates determine the position of the beginning. 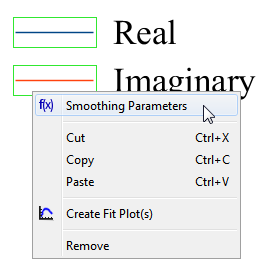 You can toggle curves antialiasing (smoothing) by selecting View → Curves Antialiasing in main menu. Please note that antialiasing may slow down the drawing if you have many data points (~100K). 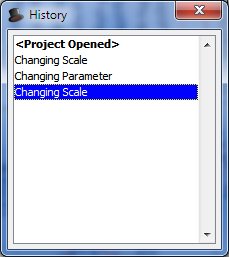 Use Project → Image Preview menu item to open image preview window. You can also use the Preview button of the toolbar or Ctrl+Shift+P keyboard shortcut (Cmd+Shift+P on Mac). 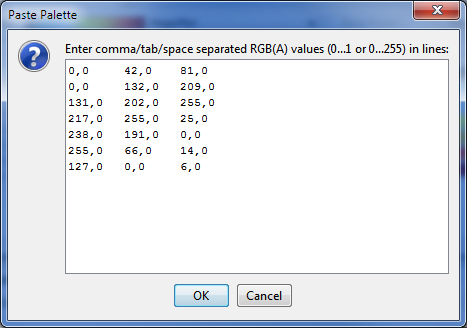 Pixel-to-Pixel — allows you to see the accurate image that you will get using export in raster image format. 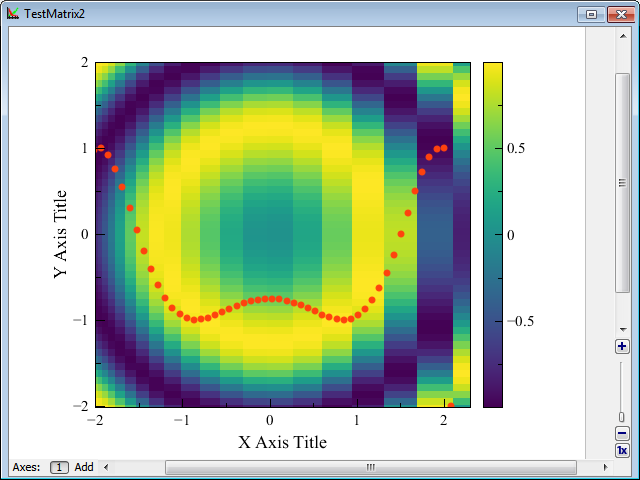 The resolution of exported raster image is evaluated as a product of canvas size and DPI value specified in Canvas tab of Figure/Fit Plot Properties window. 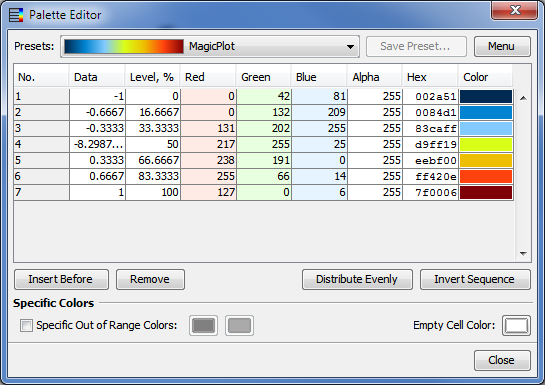 Copy magicplot.ini from MagicPlot folder in your operating system profile to the folder on USB drive which contains MagicPlot executable. 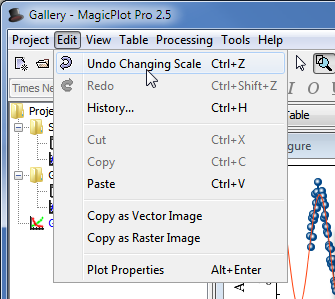 Where does MagicPlot save preferences in my operating system profile?